Overview: Who wants to go on an adventure today? Specifically, a Strange Adventure? Tighten your belt, grab a hat, and let’s see where the Showcase Presents Strange Adventures Vol. 1 takes us! Let’s start with a quick explanation about Strange Adventures. This was an anthology title started in 1950, and would feature four 6-page stories. The themes of the stories were all sci-fi in nature, whether it aliens looking to take over or destroy the Earth, or mind transference between man and gorilla. A story might feature a character gaining temporary powers, which he would then use to solve whatever problem society was dealing with at the moment. There is no continuity between the stories, so these can be read in any order. What’s great about this collection is the legendary comic talent doing some of their earliest work for DC Comics. Whether it writers like John Broome, Edmond Hamilton, or Gardner Fox, or artists like Carmine Infantino, Bill Finger, and Gil Kane, these are all names that could be on a Mount Rushmore of DC creators. Why should these stories be Showcased? 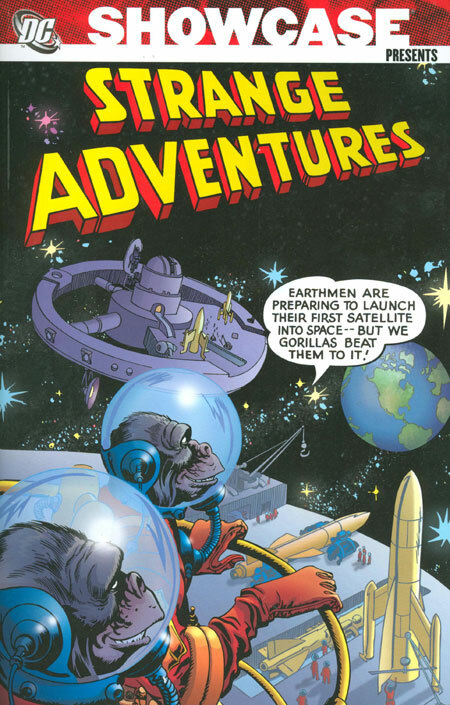 : Strange Adventures as a title ran for 24 years, going from 1950 to 1973. So historically, this is an important part of DC’s history. During it’s run, characters such as Captain Comet, Immortal Man, Animal Man and Deadman would make their debut in this title — but not in any issues collected here. These are interesting tales if you are fans of the 1950s sci-fi stories. And yes, there are enough stories featuring gorillas to make me take a look. But for the casual fan, this may not be the best book. I struggled to finish this volume. Not because the stories were bad. They were just not that interesting to me. Turning Gold Into Silver: Comic fans love a great debate. Whether it’s simple topics like Betty or Veronica, or more complex query like which character is the strongest. Even away from the comic characters, we tend to argue a lot about the eras of the comics. I’m talking the Golden Age, Silver Age, Bronze Age, and so on. Does the Golden Age start with Action Comics #1, or does it begin with the very first comics? When did we move from the Silver Age to the Bronze Age? Those are debates for other forums. I have discussed that the generally accepted starting point for the Silver Age is Showcase #4, which featured the debut of the Barry Allen Flash. That issue had a cover date of October 1956. Now scroll back up to the top of the post, and you’ll see the final issue in this collection, Strange Adventures #73, also had a cover date of October 1956. So, in my opinion, you could make the case that this Showcase Presents Strange Adventures Vol. 1 could be a collection of Golden Age comics. Admittedly, there is not much difference between issues #73 and #74, so it was more of a rolling transition into a new era of comics. If you like this volume, try: the JSA: Strange Adventures mini-issue series from DC Comics from 2005. This has been collected as a trade paperback. Written by science fiction author Kevin J. Anderson and art by Barry Kitson, the story is set firmly in the Golden Age era of World War II. Johnny Thunder decides to try writing stories for the popular science-fiction magazines of the time, by scripting stories about the Justice Society members fighting against monsters and aliens. At the same time, a new villain appears on the scene in Lord Dynamo, and it takes the entire line-up of the JSA to defeat this new threat. This really is a great homage to so many elements – whether it’s the type of stories from the Golden Age, or the fact that so many of DC Comics Silver Age writers came from the sci-fi magazines of the 1940s (Julie Schwartz, Gardner Fox, etc.). This entry was posted in DC Showcase Presents, Strange Adventures and tagged Bill Finger, Carmine Infantino, Edmond Hamilton, Gardner Fox, Gil Kane, Joe Samachson, John Broome, Otto Binder, Sid Greene, Strange Adventures. Bookmark the permalink.